Tessa Longbons | November 7, 2017. 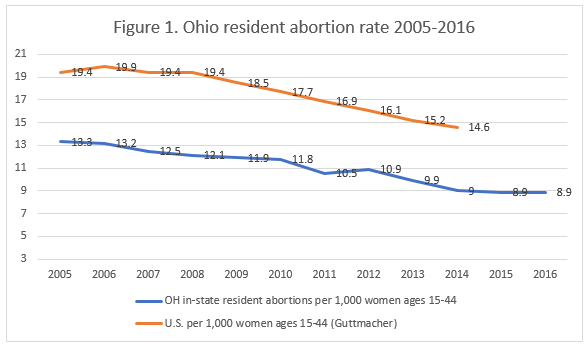 Ohio’s 2016 state abortion report shows that the state’s resident abortion rate is unchanged from 2015, consistent with the gradual downward trajectory it has maintained over the past decade (Fig. 1). The 38-page report, published every September by Ohio’s Department of Health, contains comprehensive information on abortions performed in the Buckeye State. *Information on Planned Parenthood’s Ohio market share is not publicly available. Since 1991, the earliest year with information available online, the annual number of Ohio abortions has been dropping. By 2016, the total number of abortions had declined 50 percent from 41,705 in 1991 to 20,672 in 2016. However, 2016 saw a large increase in the number and percentage of chemical abortions (Fig. 2). Ohio chemical abortions jumped 219 percent from 1,195 in 2015 to 3,818 in 2016, accounting for 18 percent of all abortions. The sudden increase came after several years of low chemical abortion totals. 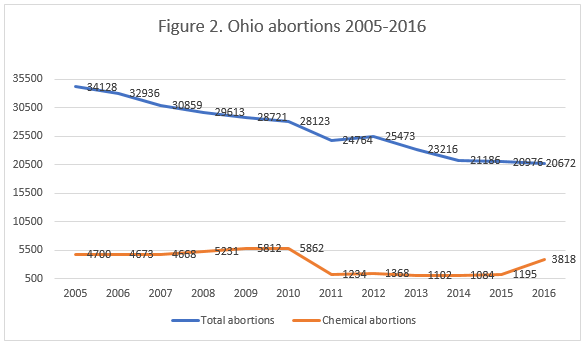 Ohio reported an abrupt decrease in chemical abortions in 2011; chemical abortions have now risen again to nearly 2010 levels. The fluctuating number of chemical abortions may be explained by an Ohio law that went into effect in early 2011. The law required chemical abortion procedures to follow Food and Drug Administration (FDA) guidelines for Mifeprex that limited the window of time in which chemical abortions could be performed, required women to make additional trips to abortion clinics, and increased the cost of this method of abortion. In 2016, the FDA updated its guidelines, making chemical abortions easier to obtain by extending the timeline when a woman could obtain the drugs from seven weeks of pregnancy up to 10 weeks. In fact, in 2012 Ohio began collecting information on which abortion drugs (mifepristone, methotrexate, misoprostol, other) were being used for “non-surgical” abortions, noting that multiple drugs could be used for a single abortion. The usage of mifepristone (Mifeprex) showed a sharp 349 percent increase from only 791 abortions in 2015 to 3,552 in 2016. Almost all Ohio abortions in 2016, 94.5 percent, were performed on Ohio residents. Sixty-one percent of women seeking abortions were in their twenties, and 63 percent had never been married. Forty-eight percent of women were white, while 41 percent were black. Thirty-eight percent of women reported having a high school diploma or GED as their highest educational attainment. Twenty percent of women said that they were using some type of contraception when they became pregnant. Abortions typically occurred early in pregnancy, with 54 percent performed at nine weeks of gestation or earlier. In comparison, 368 abortions occurred at 19 to 20 weeks of gestation and 140 abortions occurred at 21 weeks or later. None of the unborn children aborted at or after 19 weeks were reported to be viable – a “good faith judgment” required by the physician to determine and report on the state’s abortion form. One of only 14 states to report the types of complications caused by abortion, Ohio collects information on both injuries identified in abortion facilities and injuries identified later. In 2016, abortion facilities reported 32 total abortions with one or more complications. Hemorrhage and incomplete abortion were the two most common complications, each occurring 10 times. Ninety-eight abortions resulted in complications that were later identified outside abortion facilities. Incomplete abortion was the most frequent complication, occurring 45 times. The number of abortions with complications increased from 2015, when 23 abortions caused complications that were identified by abortion facilities and 33 abortions caused complications that were later treated outside abortion facilities. Difficulties in assuring full and accurate tracking of complications have been noted elsewhere. In a 2016 Charlotte Lozier Institute study on the quality of state abortion reporting, Ohio tied for third best among the 50 states, New York City, and the District of Columbia. Ohio reports in detail on the demographics of women who get abortions, the nature of abortion procedures in the state, and the characteristics of children who are killed by abortion. The state is one of only a few to report on contraceptive use and fetal viability. However, Ohio could improve the quality of its reporting by including information on the informed consent process and abortions performed on minors. While informed consent and parental consent for abortions are required by law, Ohio does not provide information on these processes in its reports. In addition, the state’s rise in chemical abortions, which are essentially intended, chemically-induced miscarriages, underscores the need for more comprehensive state reporting on miscarriages, including complications that arise from them. Ohio includes very little information on early fetal loss in its state vital statistics reports and no information on miscarriage complications. Overall, though, Ohio’s abortion report serves as an example of comprehensive state abortion reporting. Tessa Longbons is a research associate at the Charlotte Lozier Institute.